Welcome to Joy to the Heart! What is joy? What brings joy? Different people will describe joy in a variety of ways, but as a born again believer who has been saved by the blood of Christ, joy is delighting in Jesus and the Truth in His Word. Joy is found in hope and complete reliance and surrender to Christ and His Will. Being thankful for who He is and what He has done brings joy. Joy is exposed when we see Christ throughout Scripture and in the midst of our everyday. The heavens declare the glory of God. The skies proclaim the work of his hands. Day after day they pour forth speech. Night after night they display knowledge. There is no speech or language where their voice is not heard. Their voice goes out into all the earth, their words to the ends of the world. In the heavens he has pitched a tent for the sun, which is like a bridegroom coming forth from his pavilion, like a champion rejoicing to run his course. It rises at one end of the heavens and makes its circuit to the other. Nothing is hidden from its heat. The law of the LORD is perfect, reviving the soul. The statutes of the LORD are trustworthy, making wise the simple. The commands of the LORD are radiant, giving light to the eyes. The fear of the LORD is pure, enduring forever. The ordinances of the LORD are sure and altogether righteous. They are more precious than gold, than much pure gold. They are sweeter than honey, than honey from the comb. By them is your servant warned. In keeping them there is great reward. Who can discern his errors? Forgive my hidden faults. Keep your servant also from willful sins. May they not rule over me. Then will I be blameless, innocent of great transgression. May the words of my mouth and the meditation of my heart be pleasing in your sight, O LORD, my Rock and my Redeemer. Christ is proclaimed throughout creation and through His Word in the Bible! If you know God’s Word, you know His character, and if you know His character, you know His ways are good. Regardless of circumstances, you can delight in Jesus and begin to spot joy in the everyday. 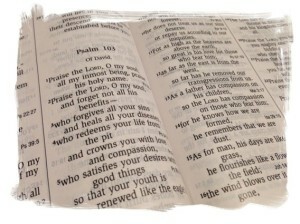 Oh, may His Word bring light to my eyes and joy to my heart – spilling over into everything I think, say, and do! I pray that by utilizing this blog space, I can reflect on Jesus’ work on the cross, meditate on Words of life and hope from the Bible, see God’s merciful hand in my family’s life, and begin to catch more glimpses of joy in the everyday happenings of my life as a stay at home mom to five precious gifts from our Lord – discovering joy in the journey. May the words that I write and the meditation of my heart be pleasing to Christ, my Savior. Just wanted to thank you for sharing so graciously! I’ve just gone through ‘Hubbard’s Cupboard” and I really want to thank you for the time you’ve taken to put together a Bible based curriculum! Thanks for giving me a great tool to lay a strong foundation on. I can’t thank you enough. I just found ‘Hubbard’s Cupboard’ last week. Before I had children, I was a teacher for eight years. I thought homeschooling my children would be a breeze with my previous experience. Boy was I wrong. This past week was my first week using your curriculum, and all week I have been sick. Yet, this has been the best week I have had with my kids in a long time. Your site just made things so easy for me. I just printed up what I needed, and applied it. It fills up my whole morning. We start at breakfast with reading our Bible story, and going over our memory verse. Then we activities related to the Bible story. After that, we sit in our living room singing songs and reading books that you have so graciously provided. After that they have an hour of free play, where they are actually enjoying playing with each with out all the bickering and fighting. Then we have lunch, and then we do any math, reading, or writing activites. The afternoon they have free to play outside. You have provided a solid foundation in which I can just add a little of my own ideas here and there. I can’t thank you enough. Thank you for your time, effort, love, and energy that you have put into this!!! Our family has been so blessed by your website! We have been doing your 2 year old program and we’re having a ball! Thank you for such amazing Christian resources and for fun ideas! We’ve been so grateful for your free curriculum and FANTASTIC ideas over the years! Seeing photos of your children doing the activities has made implementing them in my home so simple and easy since I’m a very visual person. I was so surprised to find your blog and see how much your girls have grown! :] God is so good! I cannot thank you enough for providing such a well thought-out curriculum for free. I used the 3’s curriculum with my eldest, and we just finished our first year of kindergarten. He is now reading on about a 3rd grade level, and I know that it is because he had such a strong foundation to start with! I am excited to start the 3’s curriculum with my second child this August. I truly appreciate your time and talents that you’ve dedicated to the Lord. THANK YOU!!! I have just discovered “Hubbard’s Cupboard” & I am overwhelmed with your generosity and knowledge you share on your website! I am a stay-at-home mom to a 5yr old and 3 yr old & I cannot wait to begin using the resources from your website. Again, thank you for all the time, work and energy you give to help other Christian moms! We will start using Joyful Heart Rhyming Times this week and I just wanted to say how grateful I am that you offer this! I’m not the most creative person (although, by His grace I am learning) and this is EXACTLY what I have been looking for!! Thank you and Gold bless you and your family! Hi, I just wanted to say how much I enjoy your “Mother Hubbard” site. It has been a real blessing to me and my family. Thank you so much! thank you for all of your hard work! I appreciate you generous sharing! We are using your character printables. The Bible text sheet for both faith and patience does not have a link. Do you have those sheets for these two units? If so, may I please have a copy or provide a link on the web site? I currently homeschool my 4 boys AND provide childcare to 6 more children 3-5 days a week. These children come to my home and parents expect that I provide preschool activities and kindergarten readiness skills. I have always pulled together my own curriculum from various resources, but I ran across your Hubbard’s Cupboard site and I love it! I am able to incorporate Bible teachings for children who often don’t go to church and they’re parents think it’s great! =) The songs all in one place are an invaluable resource to me. Thank you!